First class efficiency, service, control and flexibility for modern businesses to thrive. 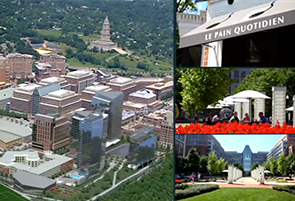 A NEW PERSPECTIVE ON OFFICE AND WORK SPACE IN ALEXANDRIA’S MOST VIBRANT NEIGHBORHOOD. PRIVATE LOBBIES PROVIDE LARGE TENANTS WITH IDENTITY AND CONTROL. Whether your business or organization needs to occupy space in a single tower or requires the expansiveness of combining floorplates across both towers, 765 John Carlyle offers the flexibility to configure to your needs.